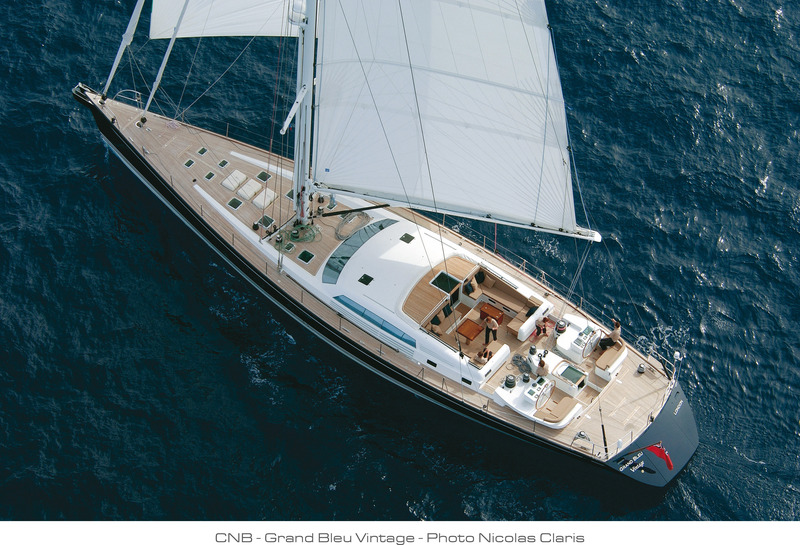 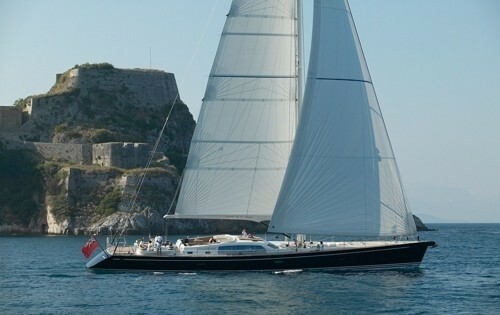 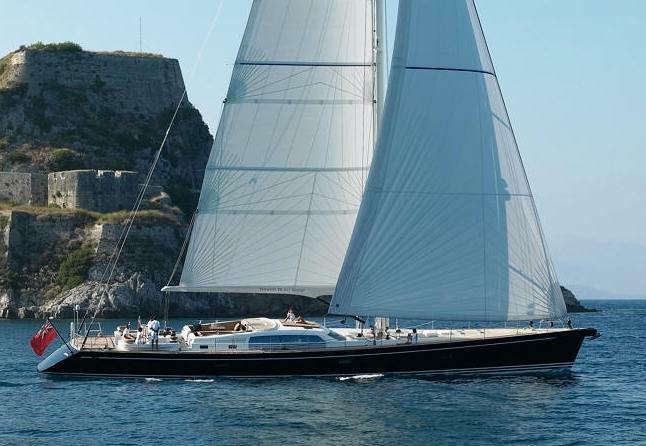 GRAND BLEU VINTAGE is a 29m/95ft sailing yacht built by CNB in 2003. 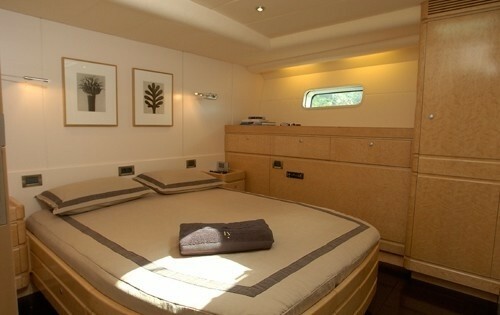 She was designed by Philippe Briand with interiors by Vripack. 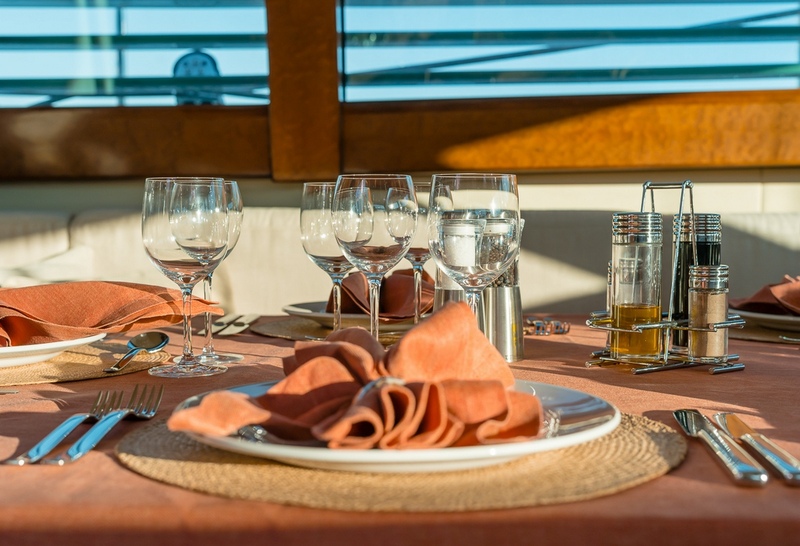 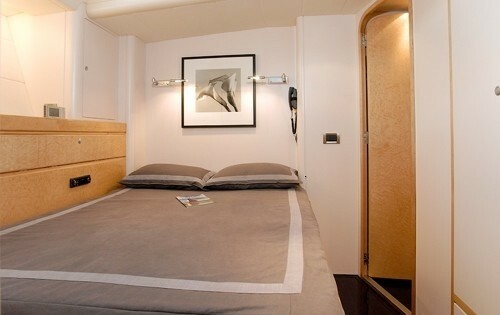 Accommodation onboard is offered in 4 cabins for eight guests. 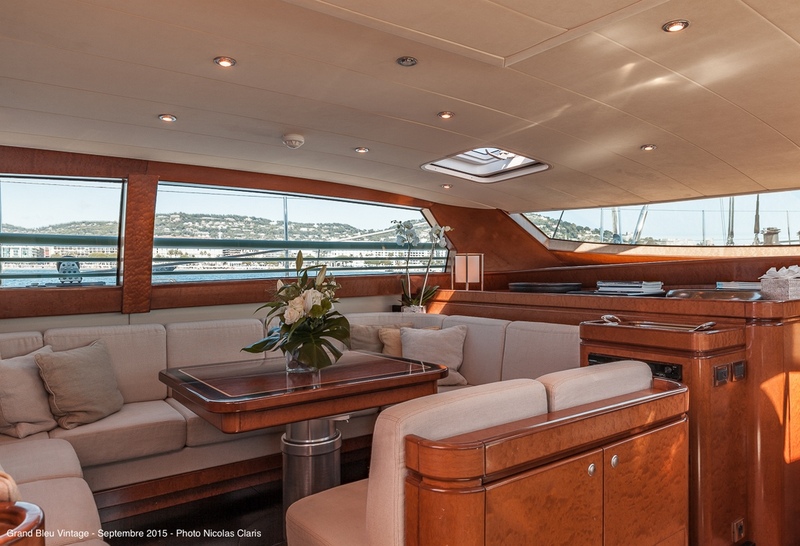 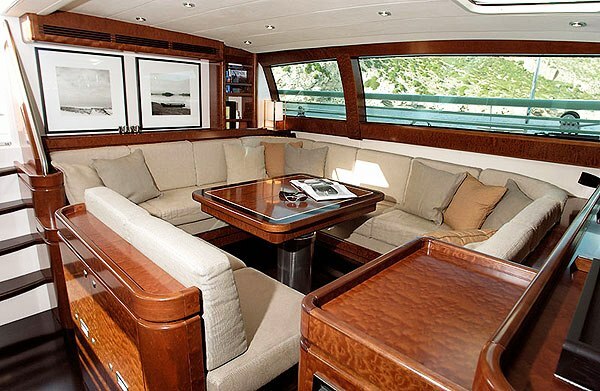 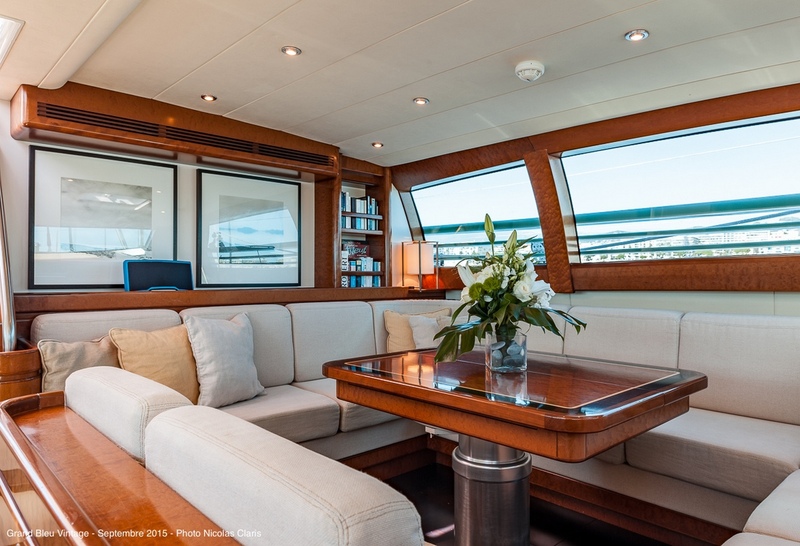 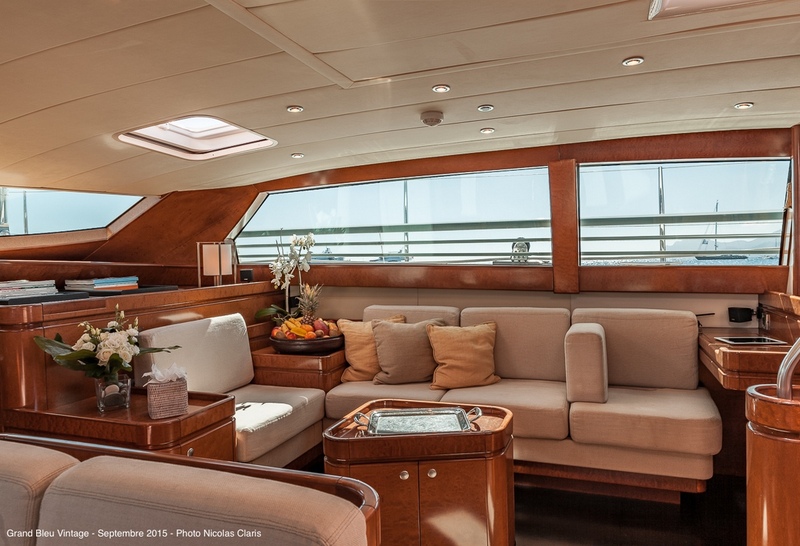 She features large decks, clean of clutter, and a bright and stylish interior. 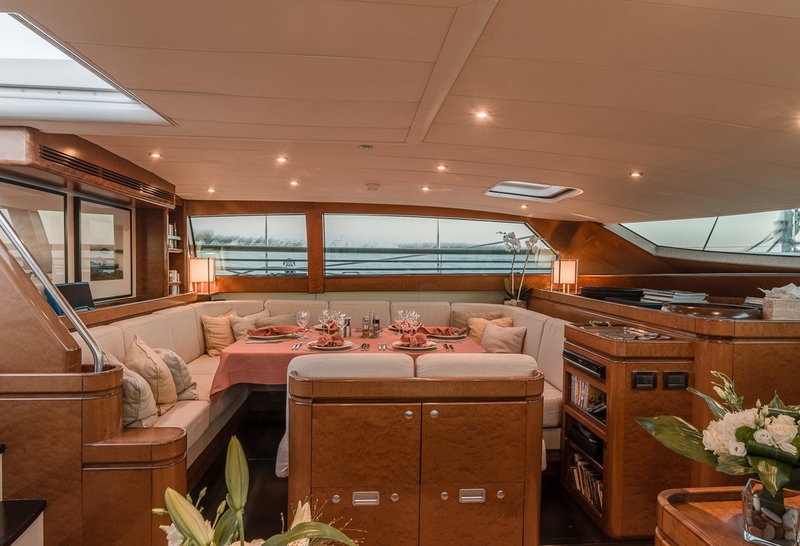 Her impressive lateral windows particularly in the saloon, which can be easily protected by shutters, provide an excellent connection with the entire outside goings-on. 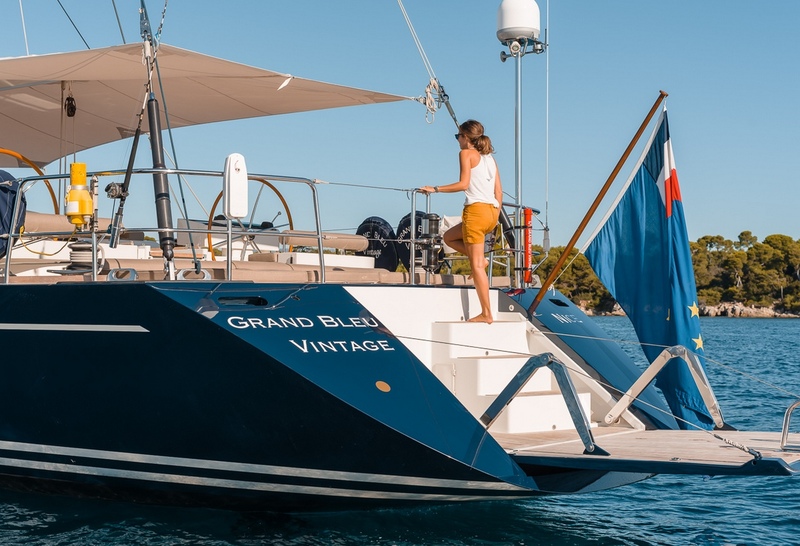 GRAND BLEU VINTAGE has been expertly designed built with fine materials – as evidenced in the lack of ‘engine noise’ while the yacht is under motor. 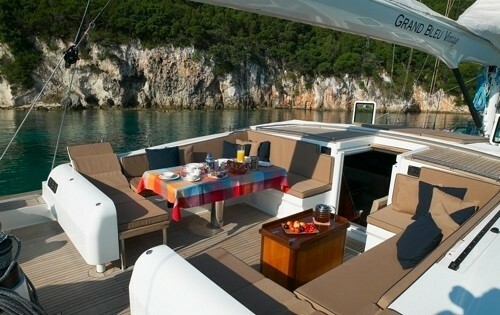 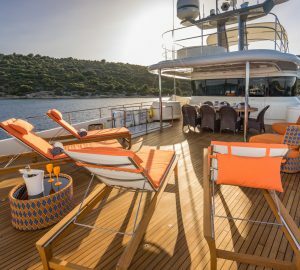 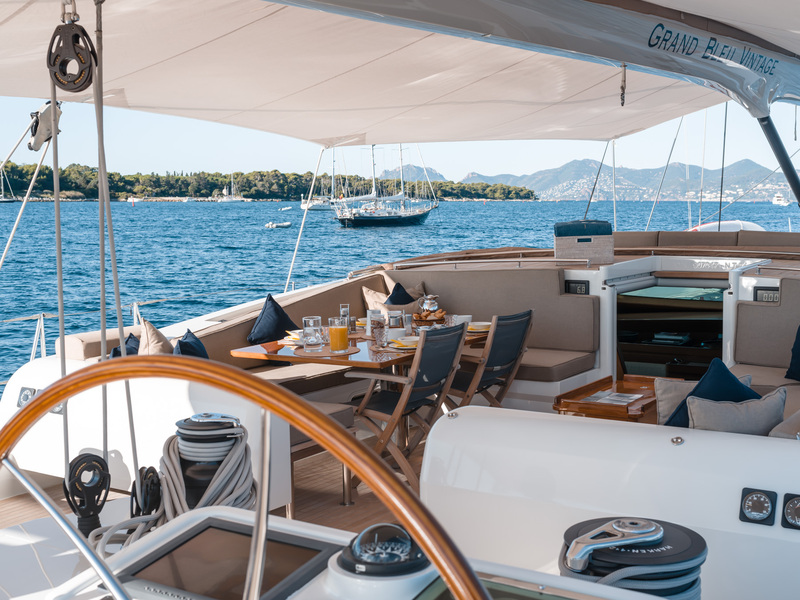 As a modern yacht with a contemporary design, GRAND BLEU VINTAGE offers guests a large central cockpit. 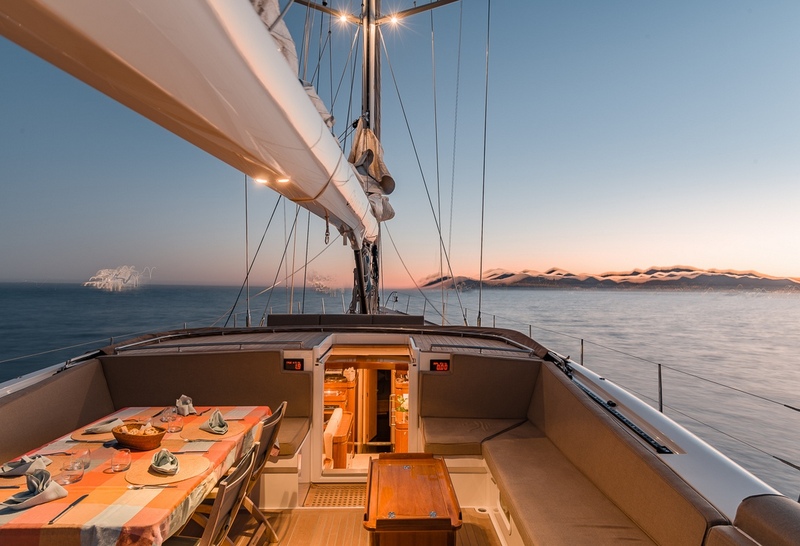 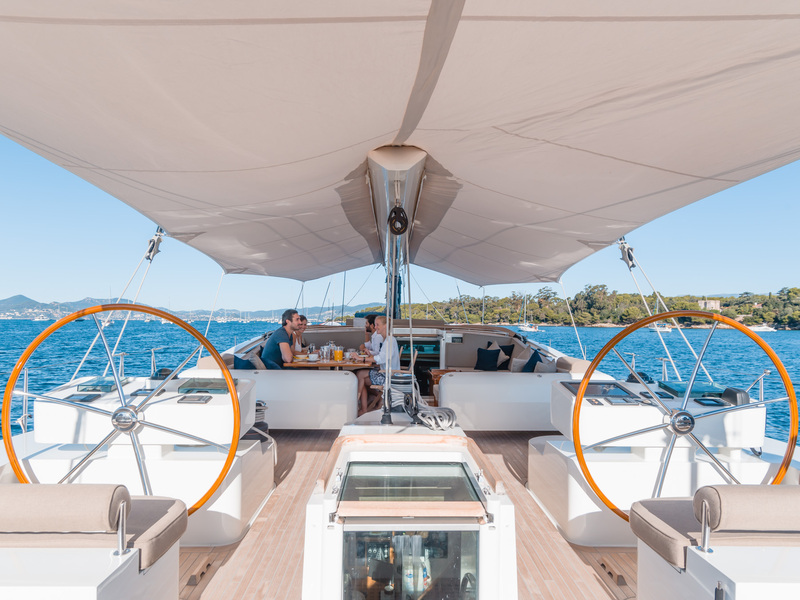 The cockpit has been created for outside on deck living and is the ideal centre point for relaxation, entertainment and activities, not to mention sailing. 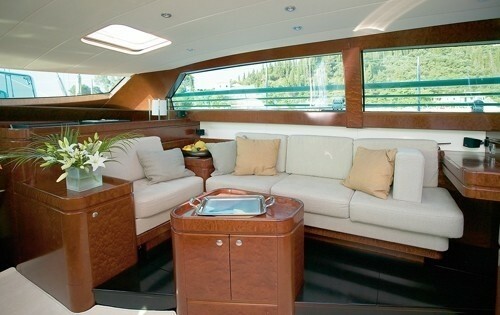 Her fold-down aft platform allows easy access for swimmers to the water, water toys and also the tender. 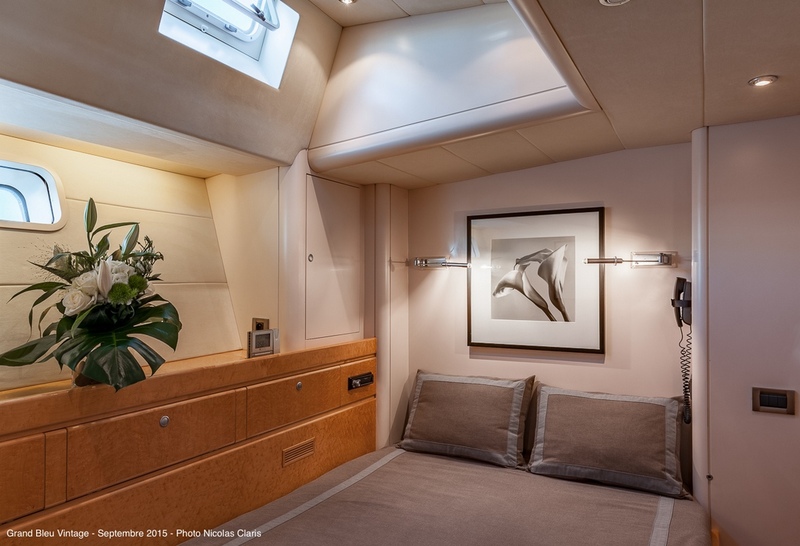 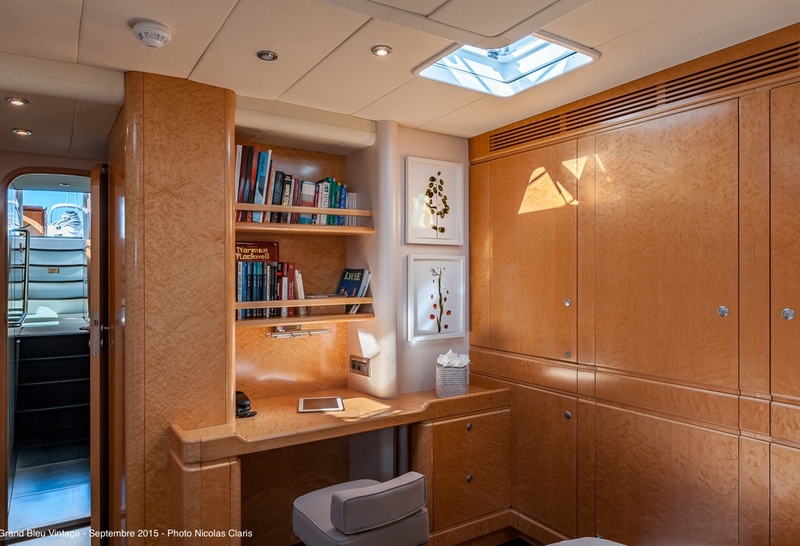 This crewed sailing yacht’s two steering stations allow greater visibility, and they create a wide central passage down to the transom. 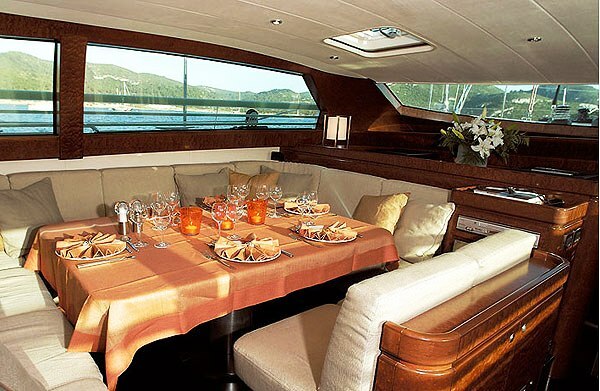 Her crew of 4 professionals will do their best to ensure you have an excellent experience. 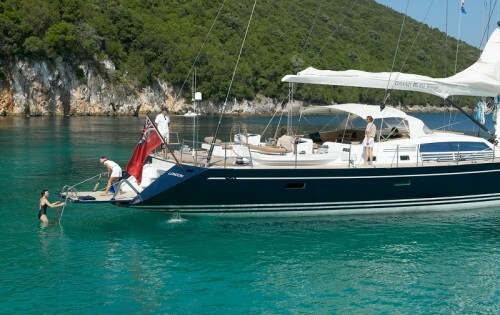 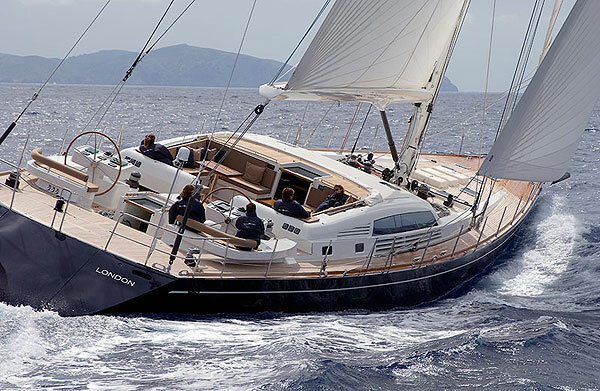 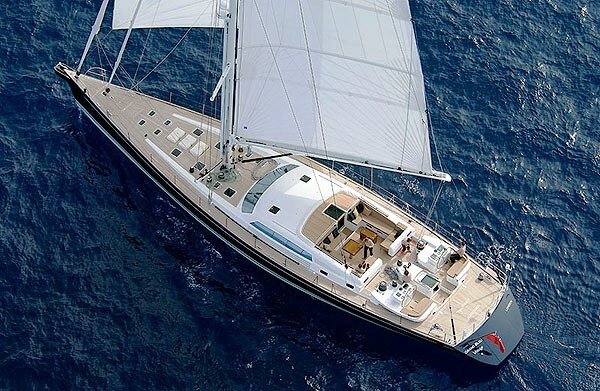 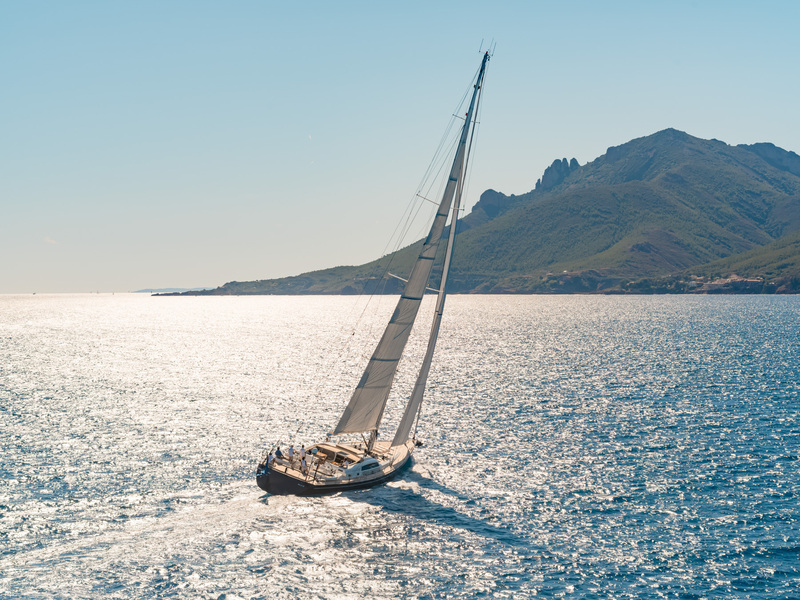 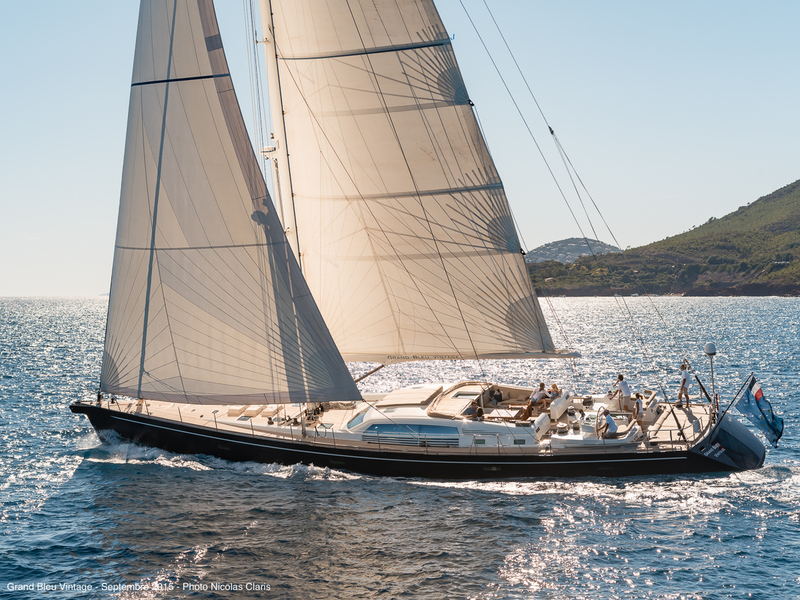 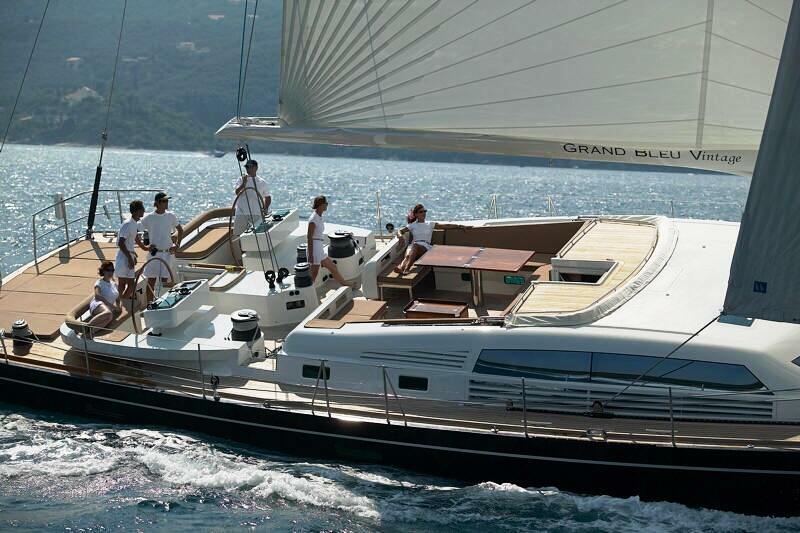 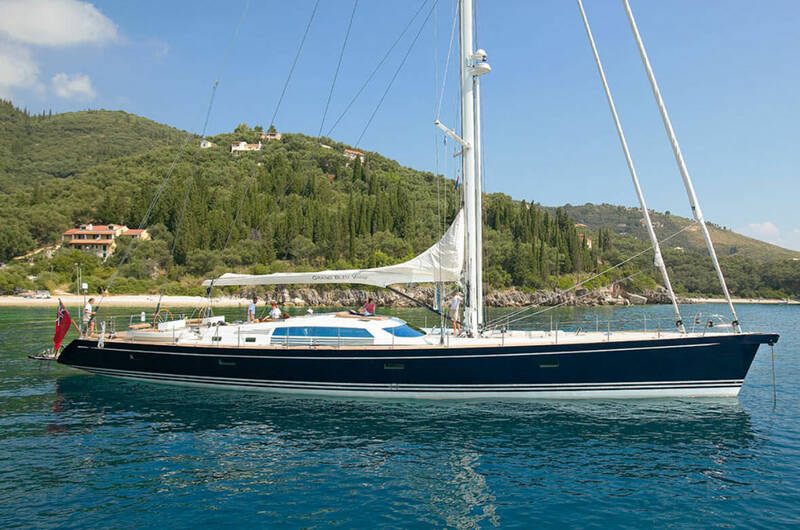 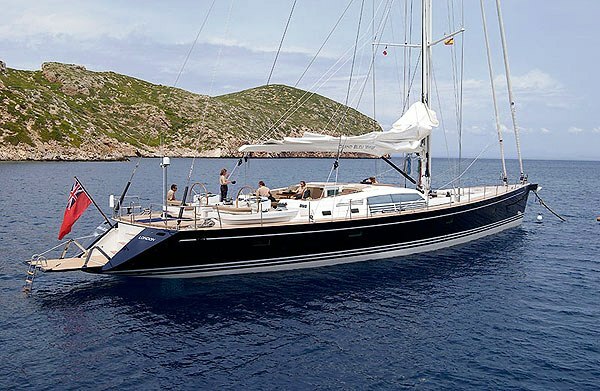 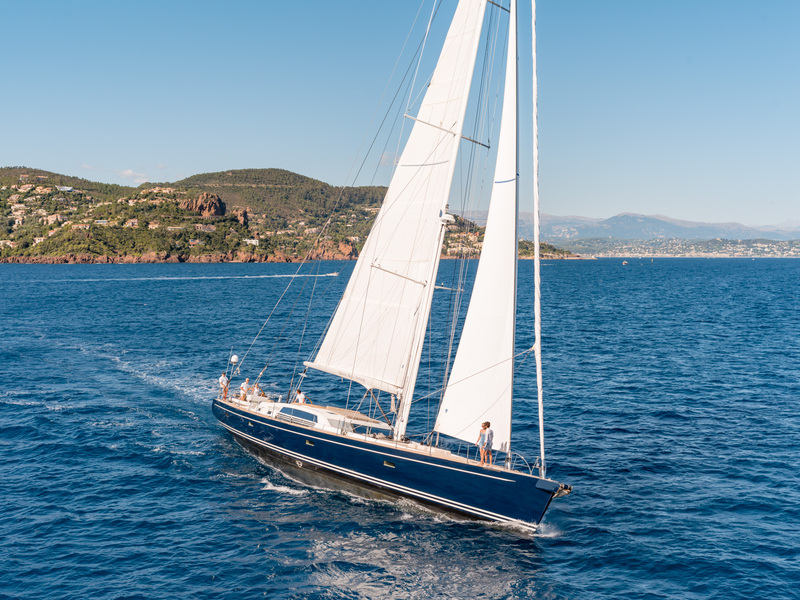 GRAND BLEU VINTAGE is a superb sailing yacht and will ensure a fantastic vacation. 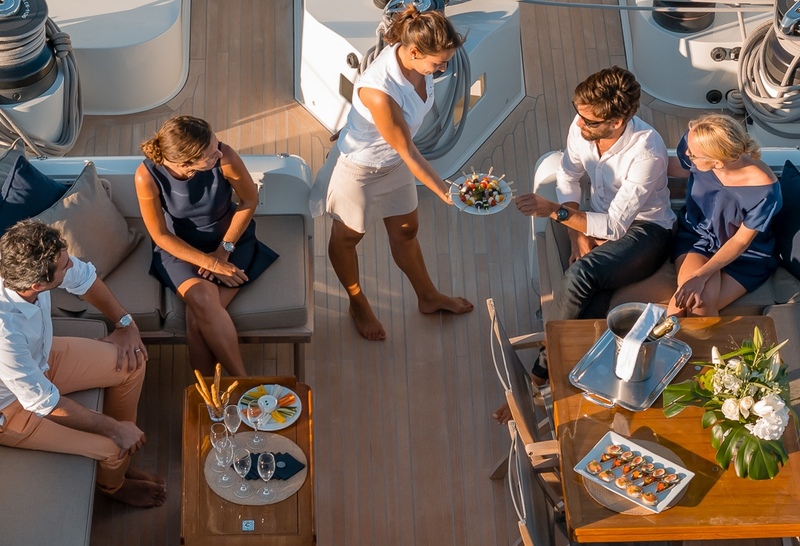 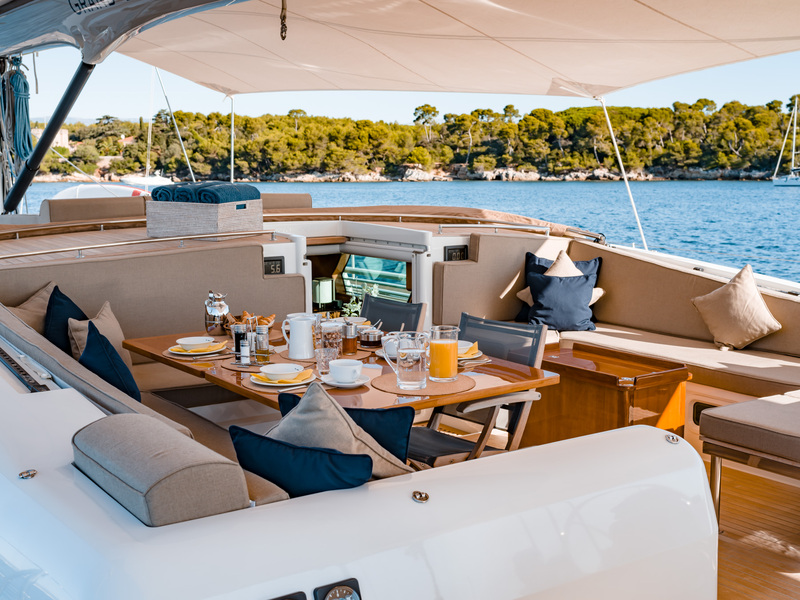 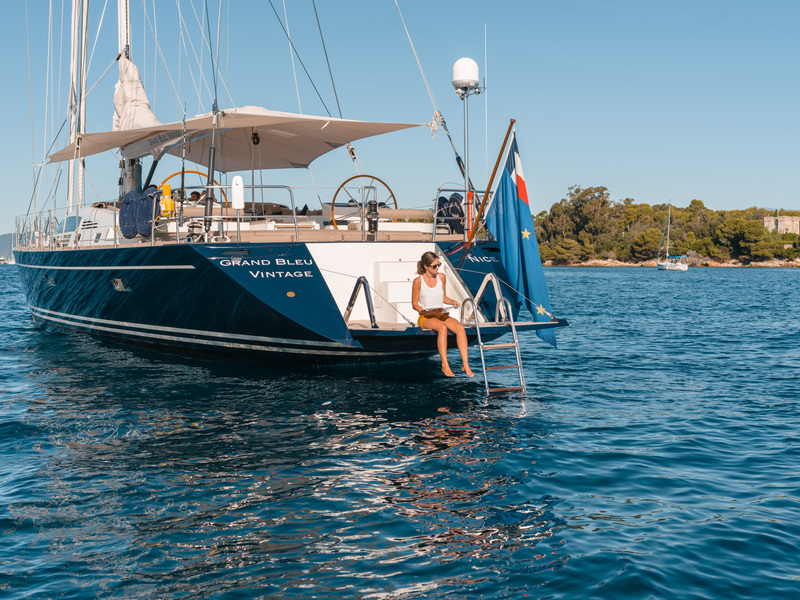 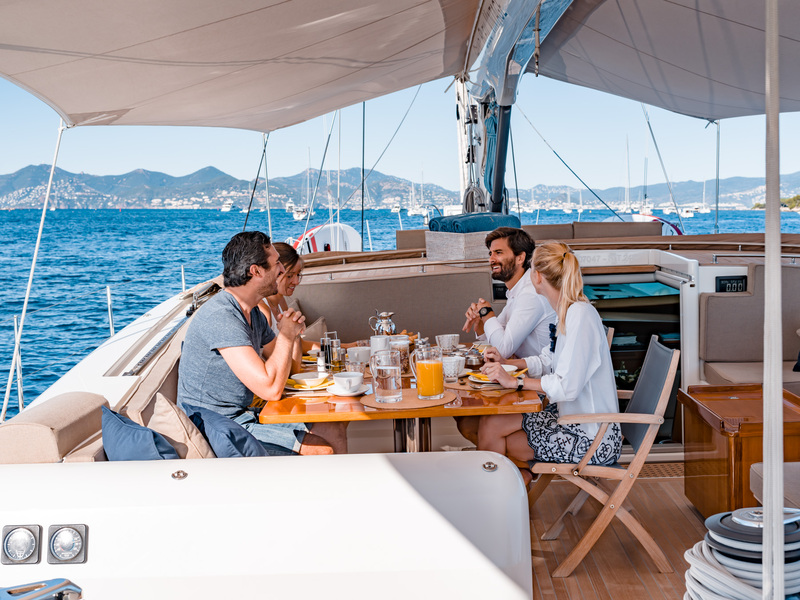 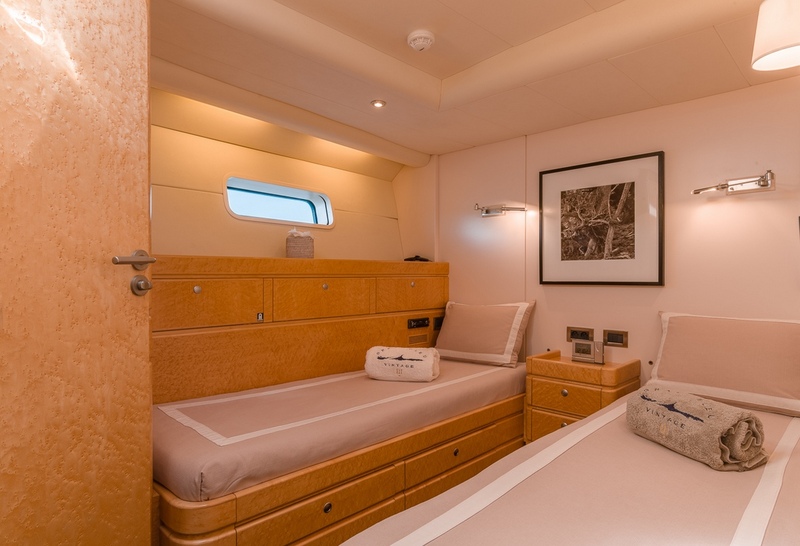 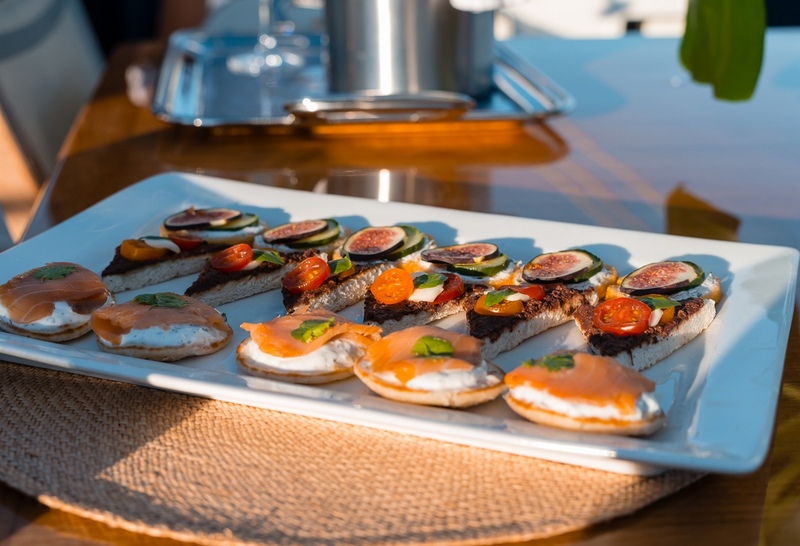 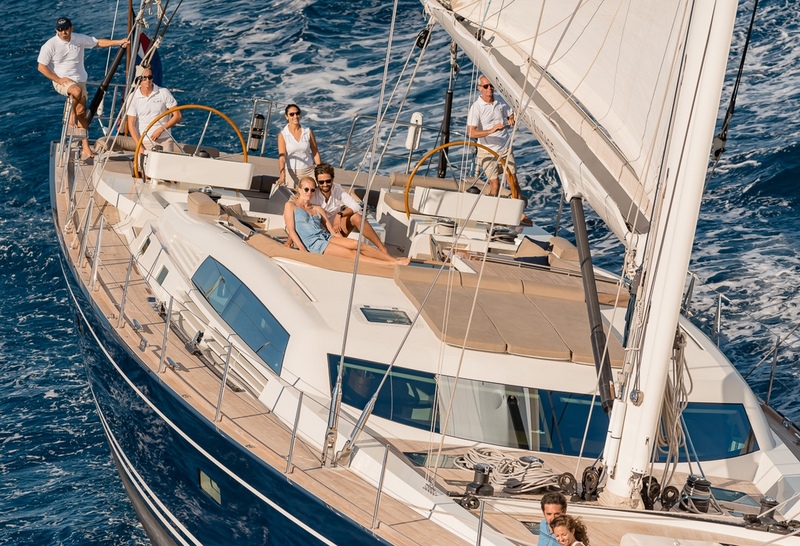 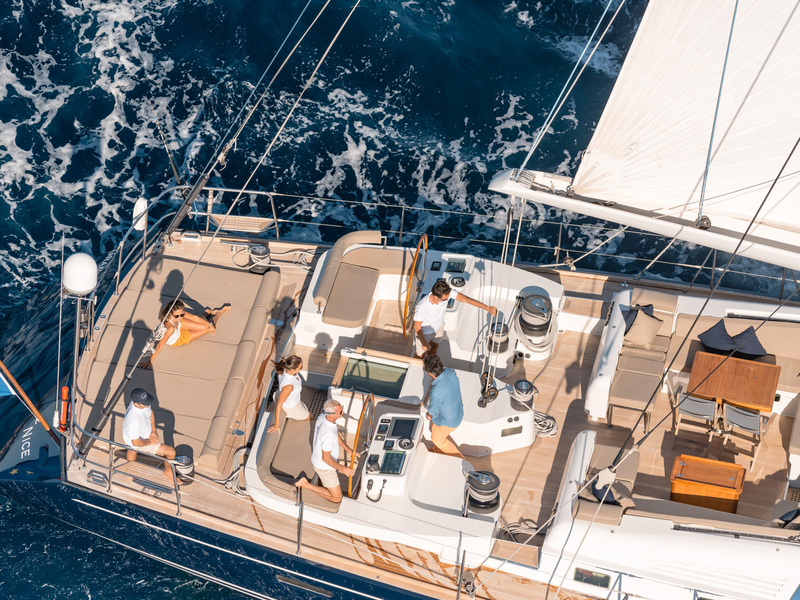 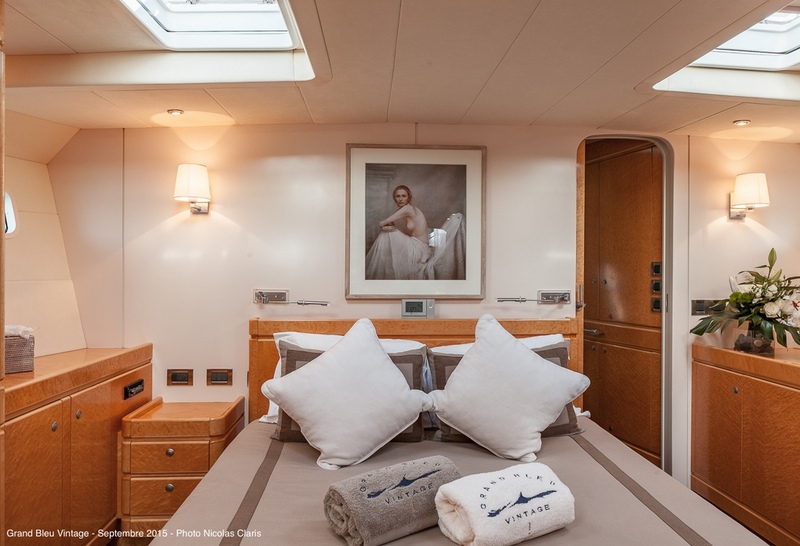 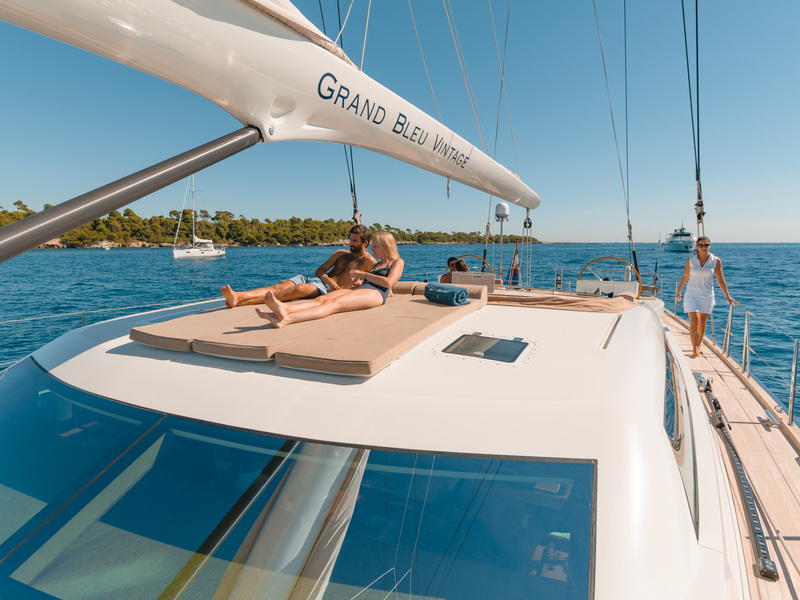 Mediterranean sailing charter yacht Grand Bleu Vintage accommodates a maximum of eight charter guests in four modern, stylish and bright cabins. 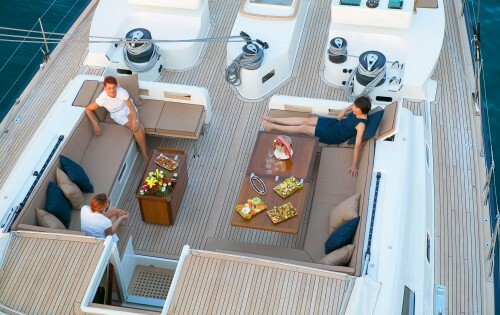 There are 3 lovely double cabins and one twin cabin. 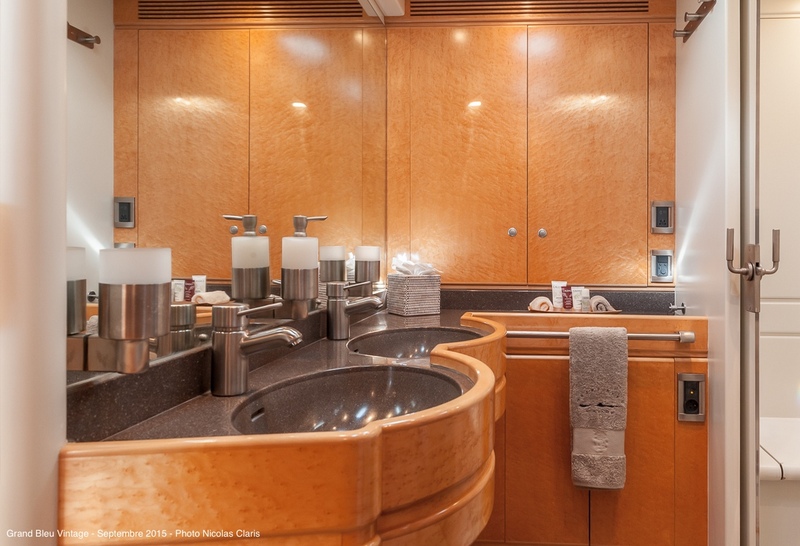 All rooms have their own ensuite bathrooms. 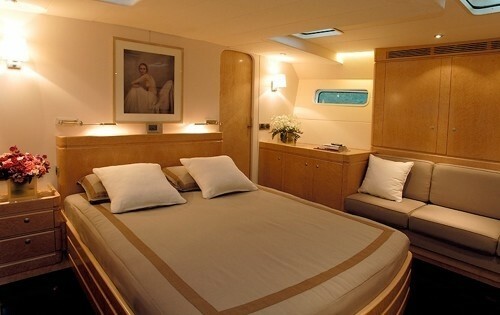 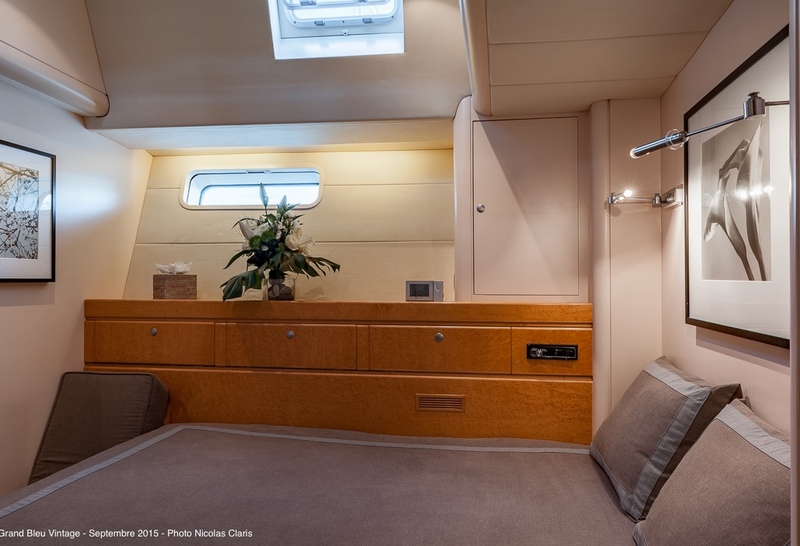 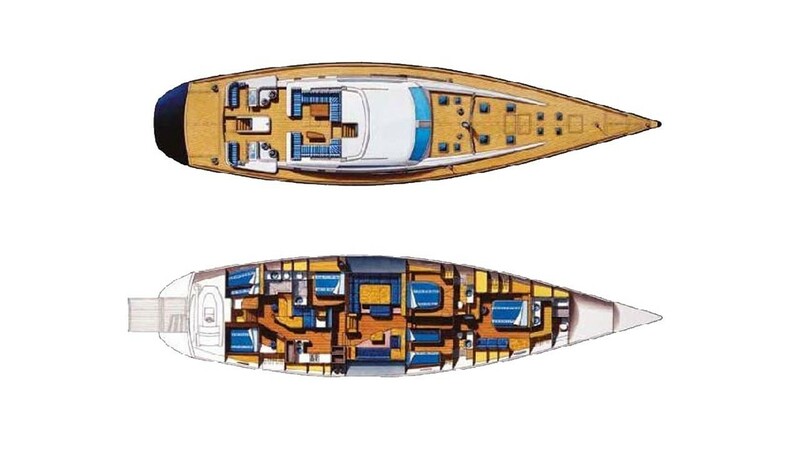 The crew’s cabins are located away to the aft of the yacht. 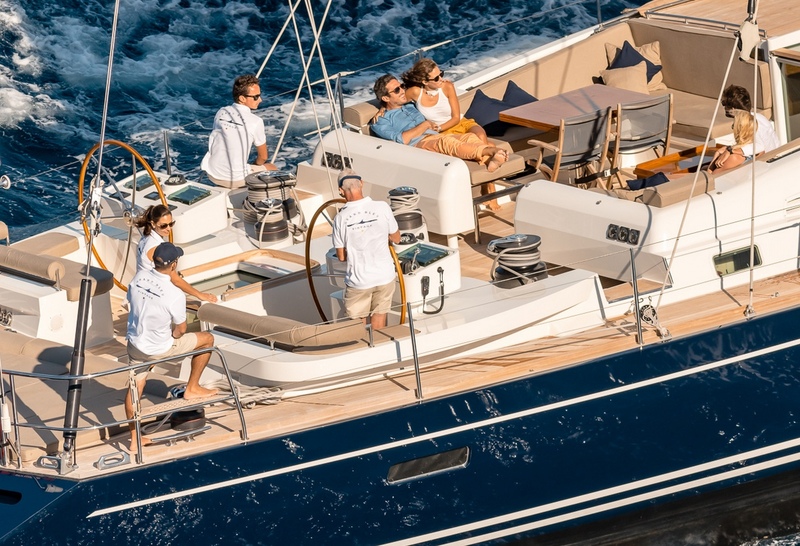 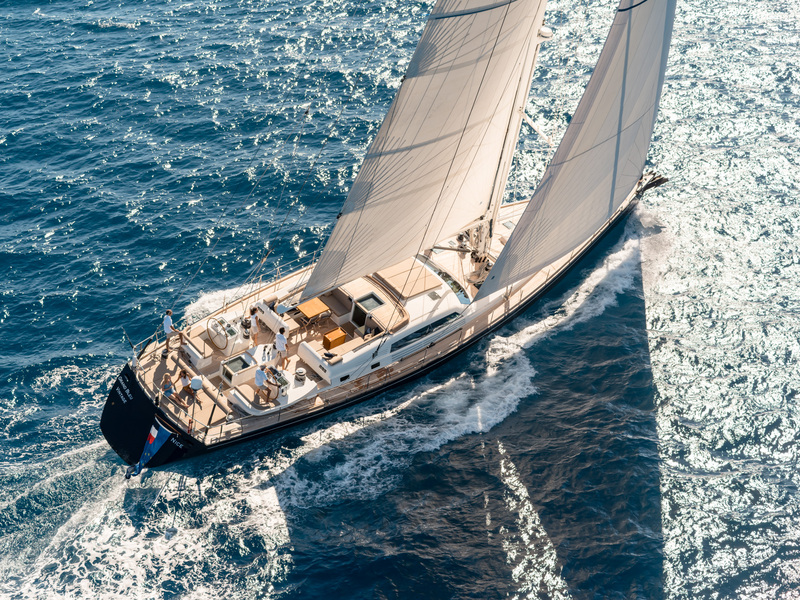 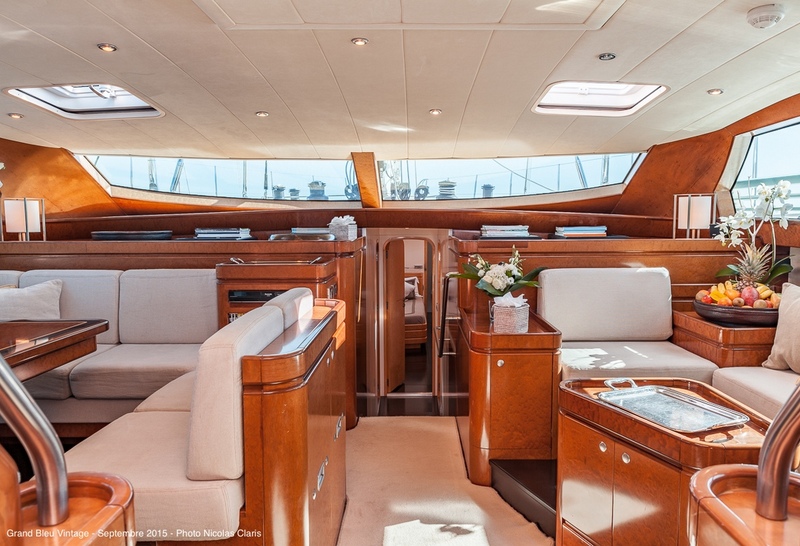 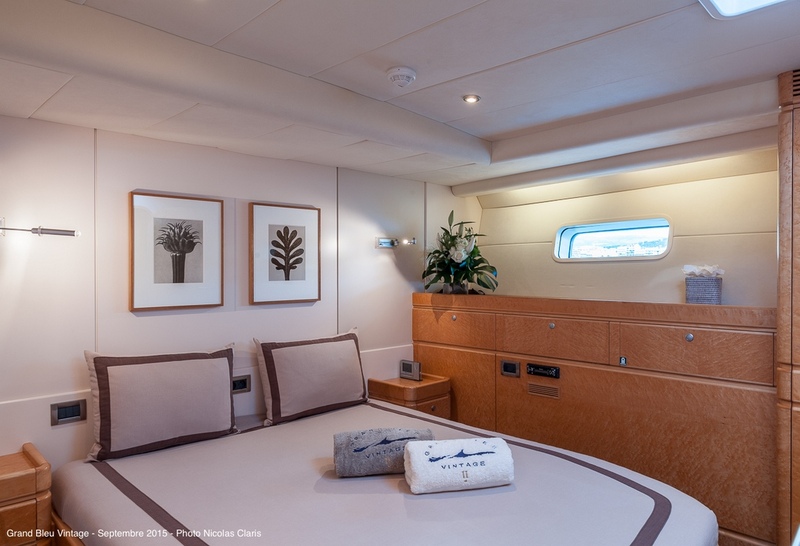 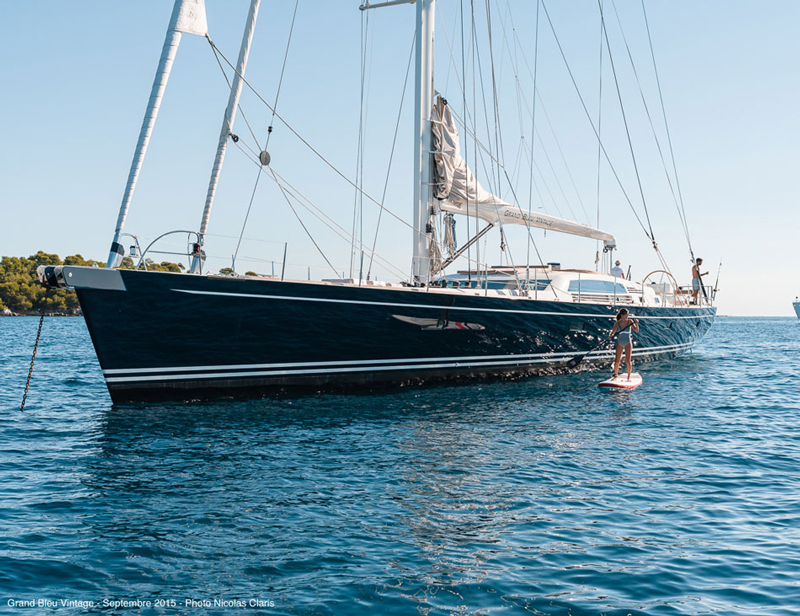 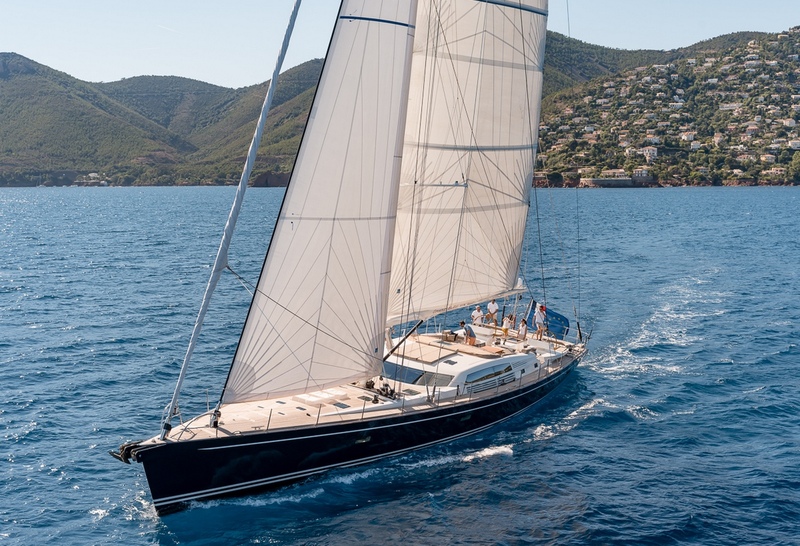 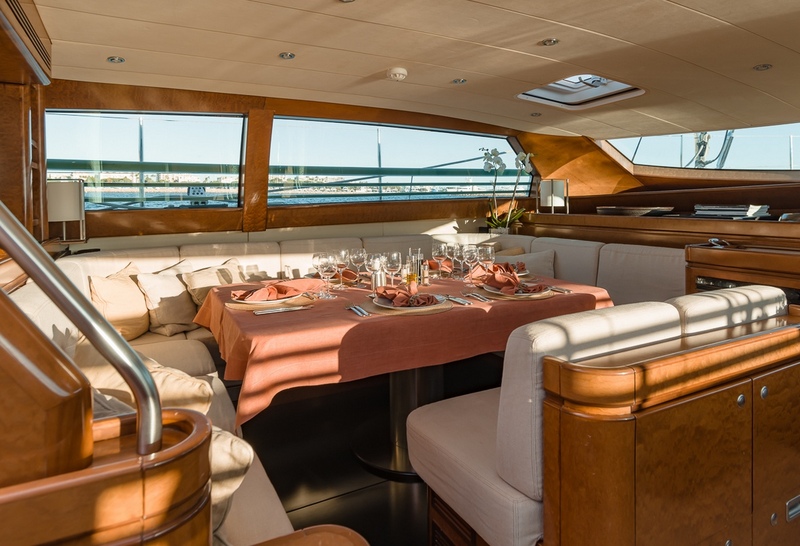 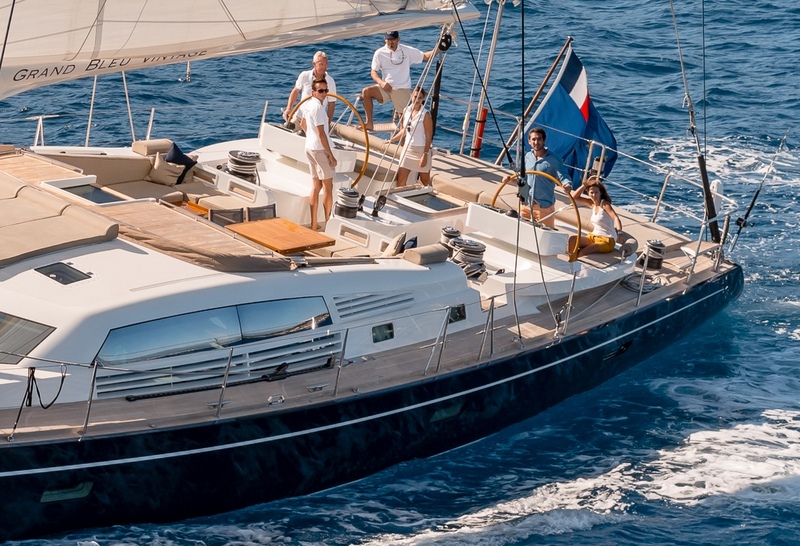 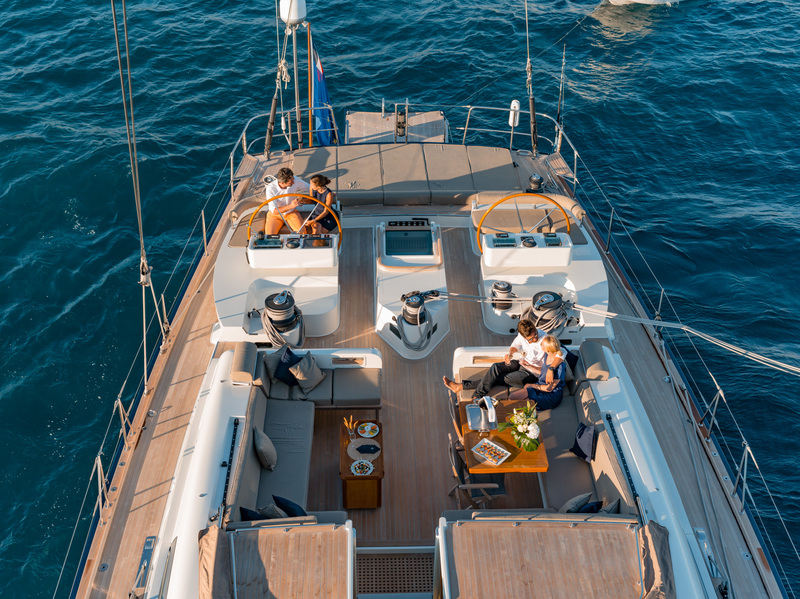 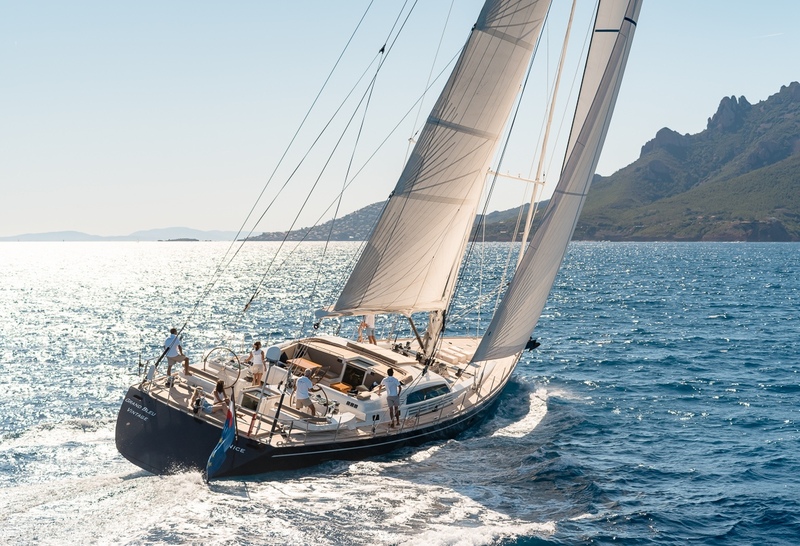 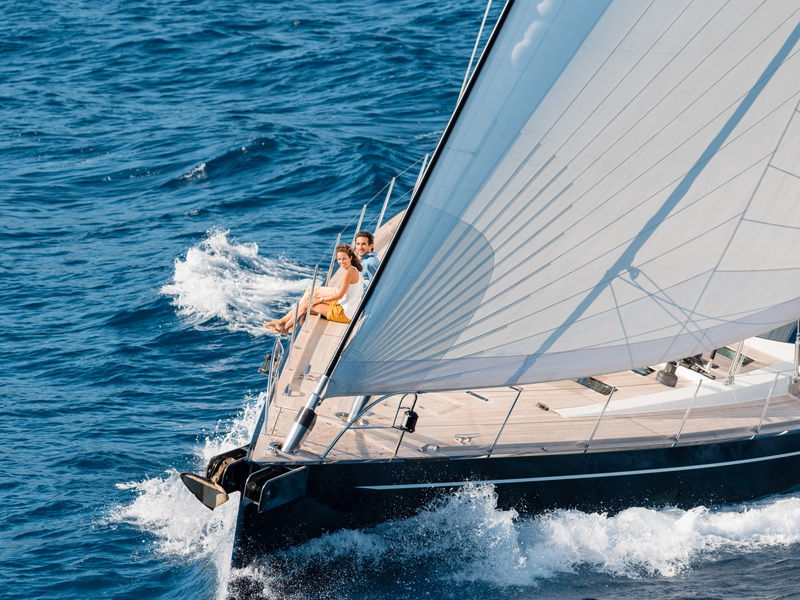 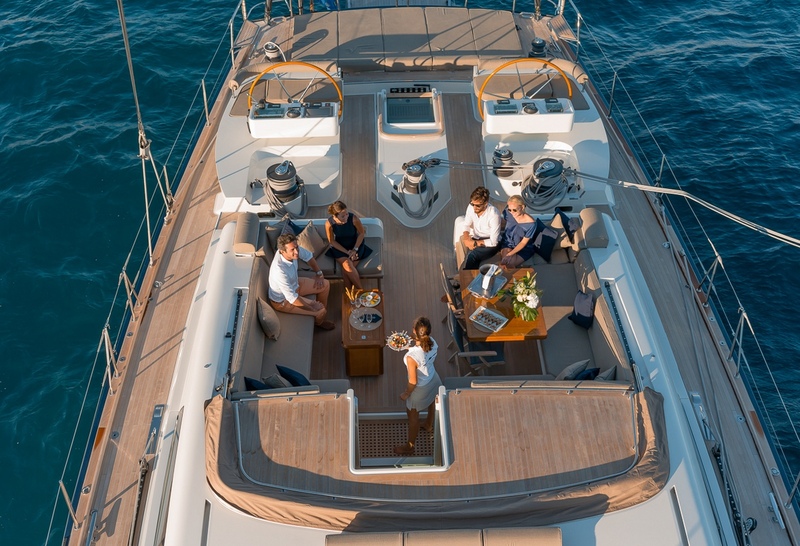 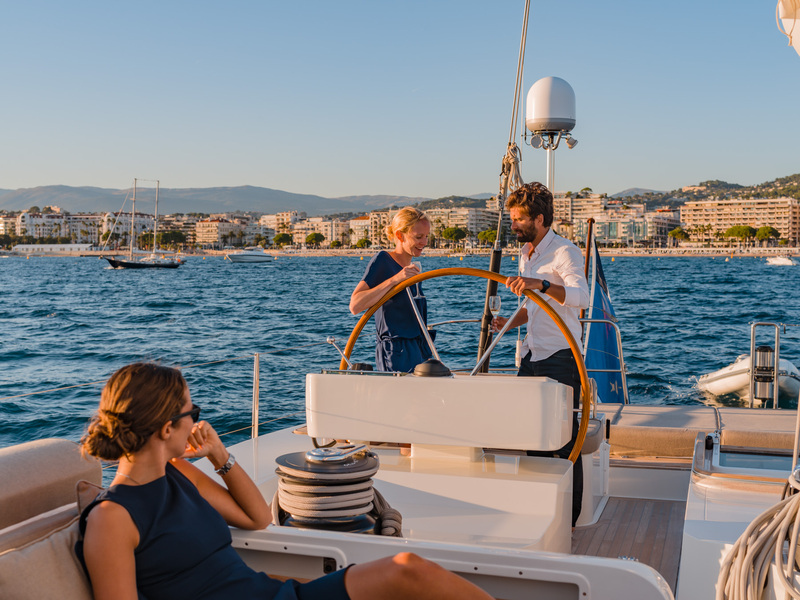 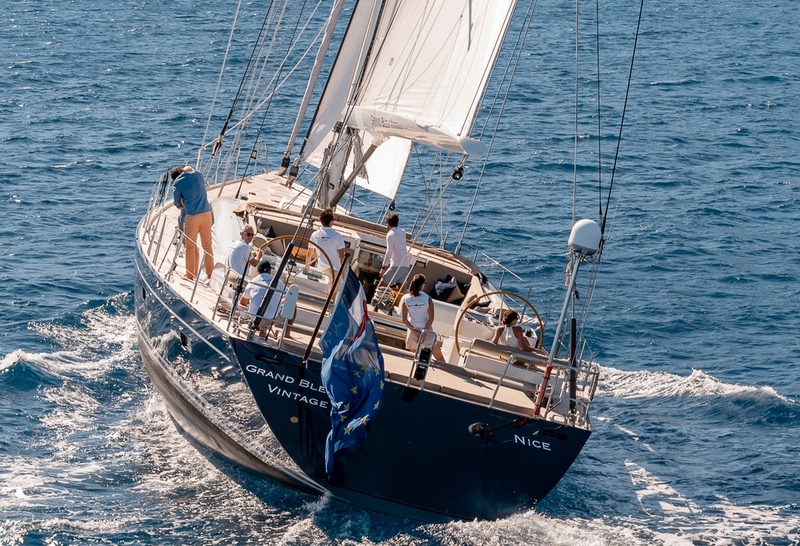 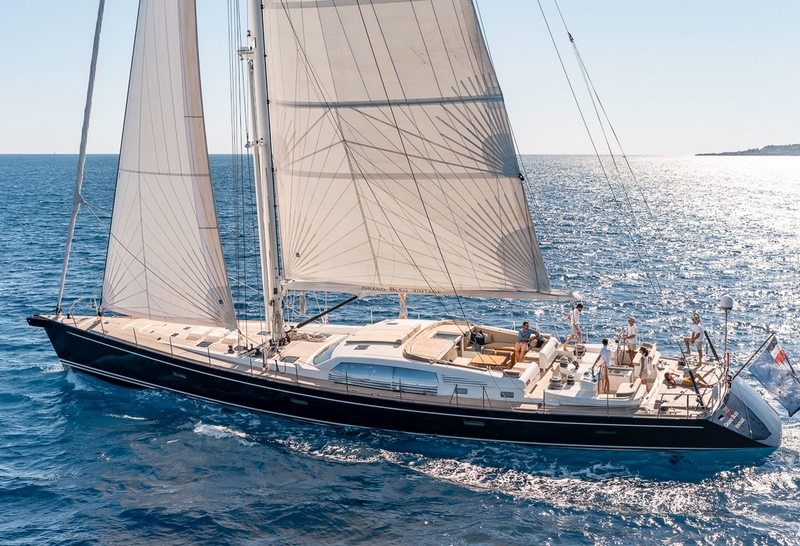 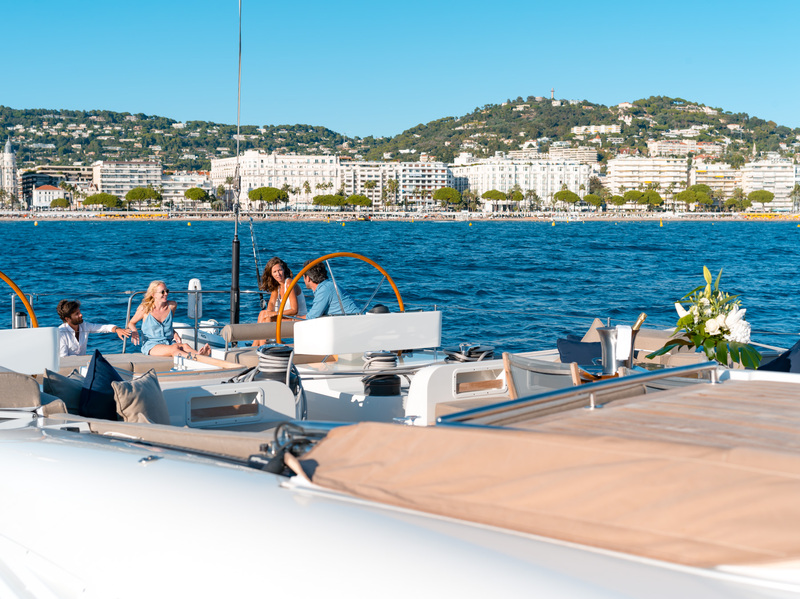 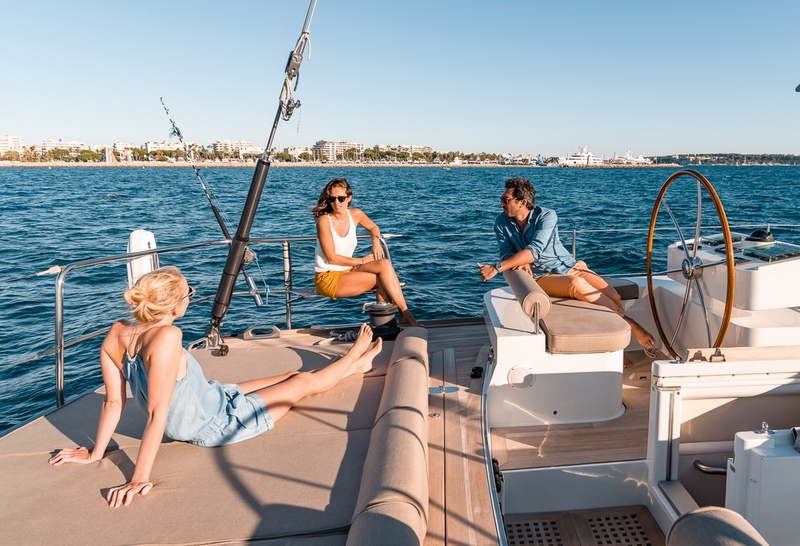 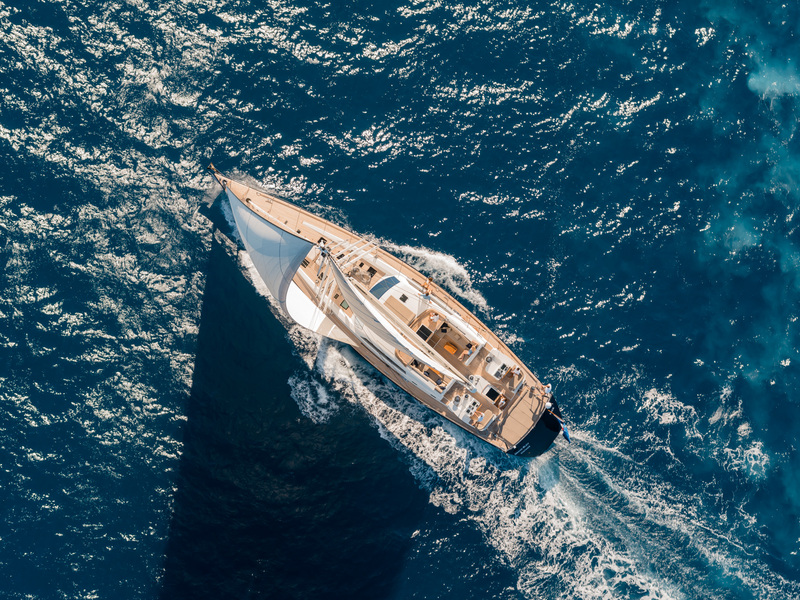 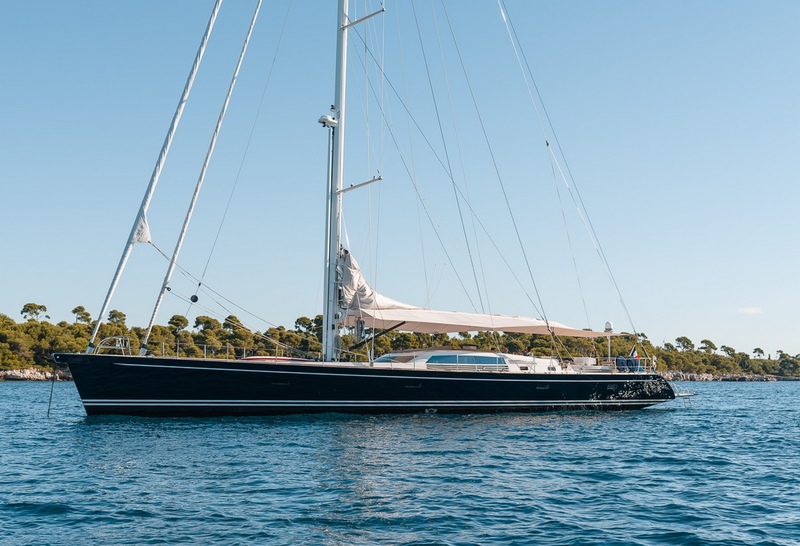 Luxury Mediterranean sailing charter yacht ‘Grand Bleu Vintage’ offers the following yacht charter extras and amenities: Grande Blue’s main tender is a Water Jet boat with 80 H P water jet engine. 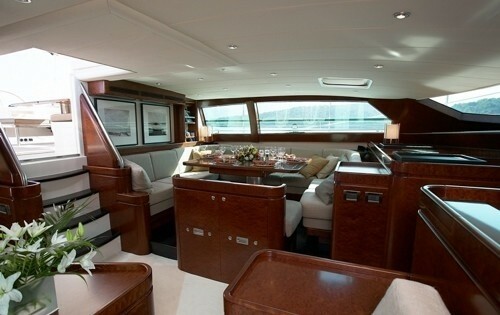 The yacht also has a second tender which is a Zodiac R.I.B. 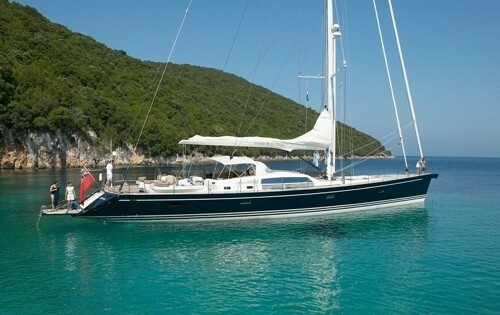 with a 15 H P outboard engine. 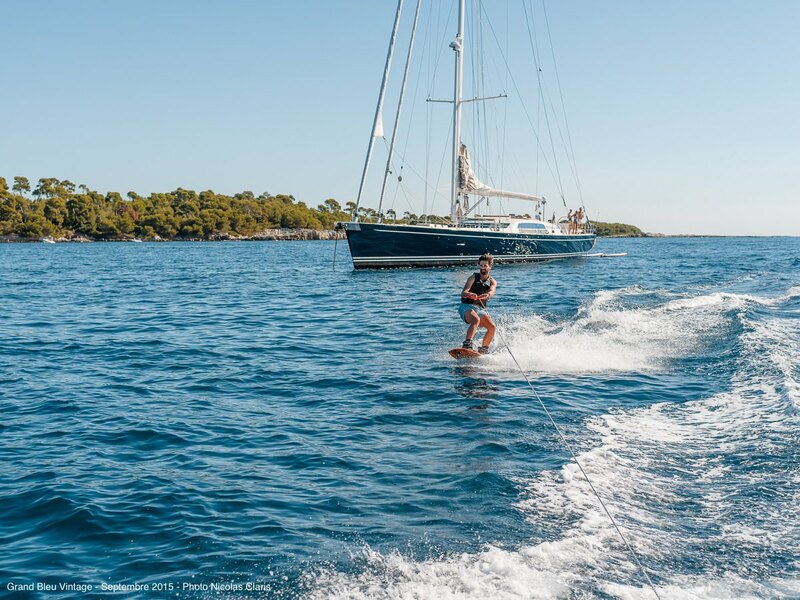 She also provides a Wake board and towable water toys. 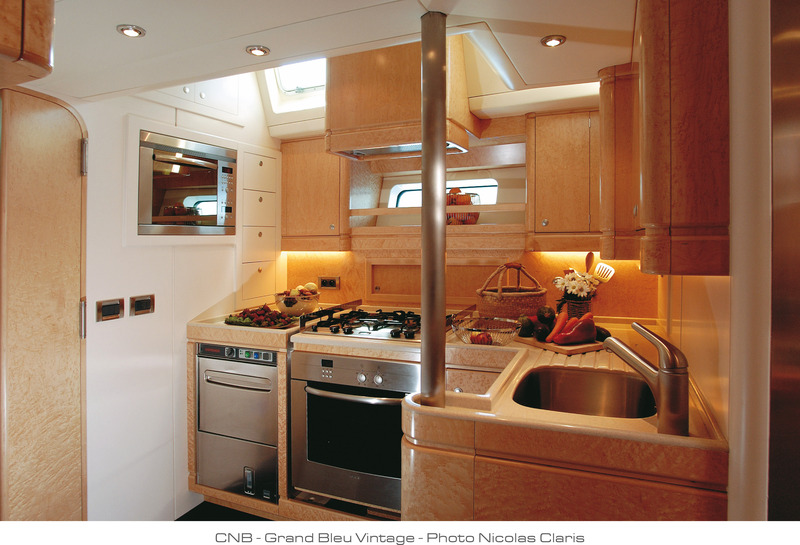 Grand Blue Vintage’s other general yacht charter amenities includes: an Ice-maker, AC, a Water-maker, a Personal Computer, a sat phone and fax & e-mail, a Plasma screen TV & DVD system, a Radio CD (in each cabin), a Hi fi sound system (in the main saloon and cockpit area), Electronic deck-chairs, a deck fridge, sun bathing cushions, a bimini & awnings, sun towels, a superb Bathing platform, a deck shower, snorkeling and fishing equipment. 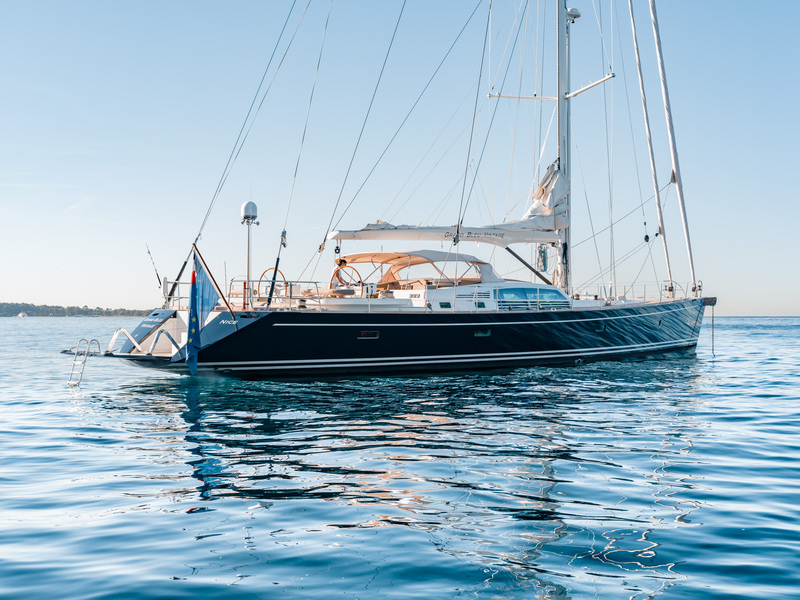 She also has two Generators of 30 KW & 17 KW, her Sail area is 4,477 square feet, she has a Bow thruster & Hydraulic powered winch system and a B & G Navigation station.